One of the nice things I like about Longines, is their trick of producing high quality watches at affordable prices. And that’s what we’ve got here with this vintage Auction find for under a £100. I say value for money as I spotted a pre-owned one, co-incidentally just the other day from a Retailer, for £450 and this one is in far better condition. 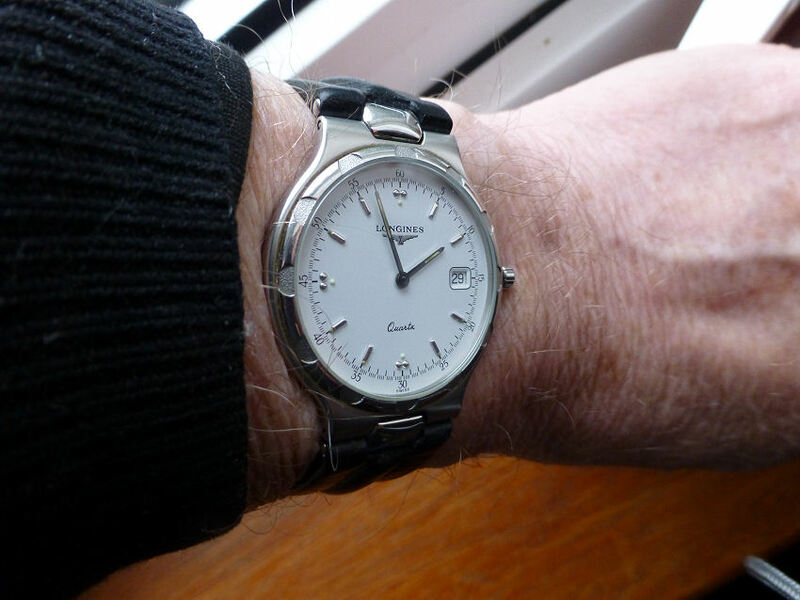 Very neat Longines Conquest quartz Date watch – c 1992? 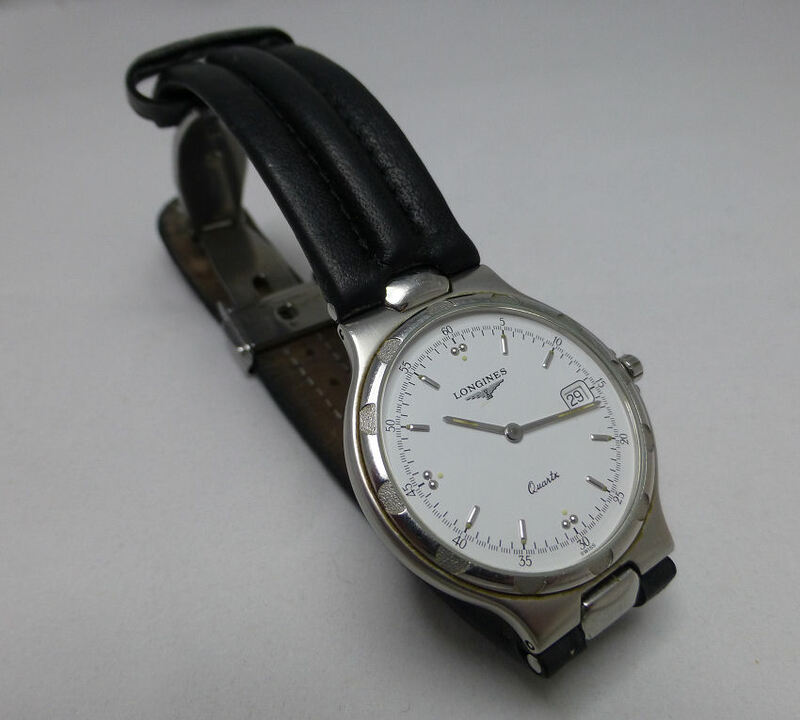 This is the Longines 1992-4 Conquest Date model in stainless steel, with the Longines L1.614.4 ETA quartz movement. Slipped into a sleek well finished stainless case that’s only at around 5.5 mm thick is what I call neat. In fact the entire watch is neat at just around 33.6 mm in diameter. This version has an original Longines French made leather strap, with the proprietary Longines deployment clasp with twin button release. 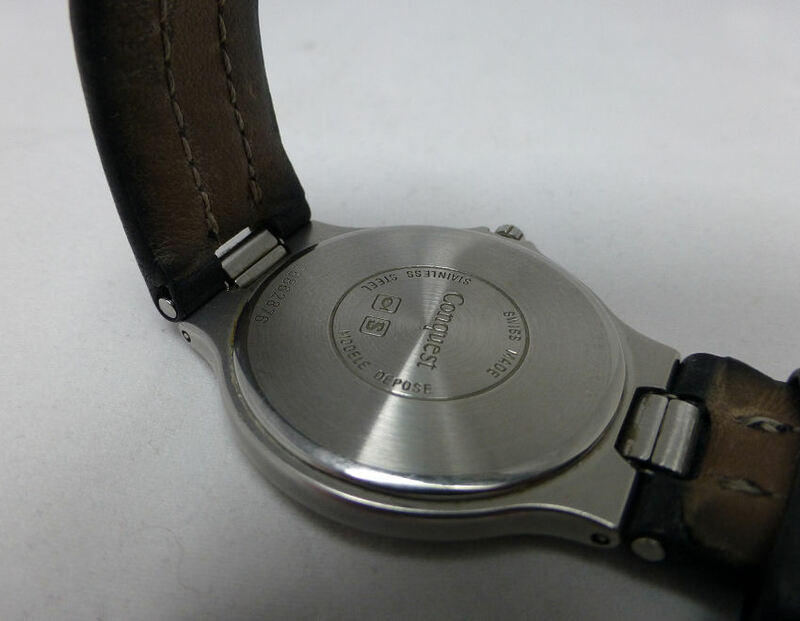 Note this is a bespoke strap as it has to fit the lug case design with the centre cut out. I also noted when searching this model on Google, it’s actually rare indeed to find a strapped version, as almost every one I’ve seen comes fitted to the Longines bracelet. Neat Longines with 5.6mm thick stainless case & original deployment fitting. Anyway this watch is in pretty much perfect condition with no marks or scratches at all (I hasten to add that the images shown are as I bought it, uncleaned), the crystal is perfect and there are no intrusion marks on the back, which is also pristine. The fact there are no intervention marks is a real bonus, as so often ex Auction pieces have had a few over zealous buyers poking around them with their penknives! (something that really annoys me!). The strap is not frayed but is a little oily with some accumulation of crud from been worn perhaps 24/7 by the previous owner, so a bit of simple cleaning is needed. 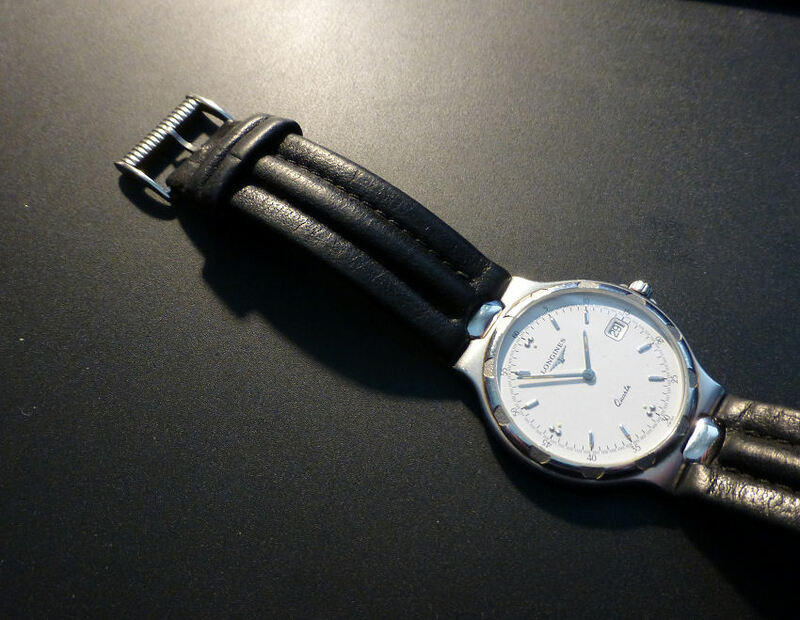 Original Longines deployment fit – with quick release adjuster. 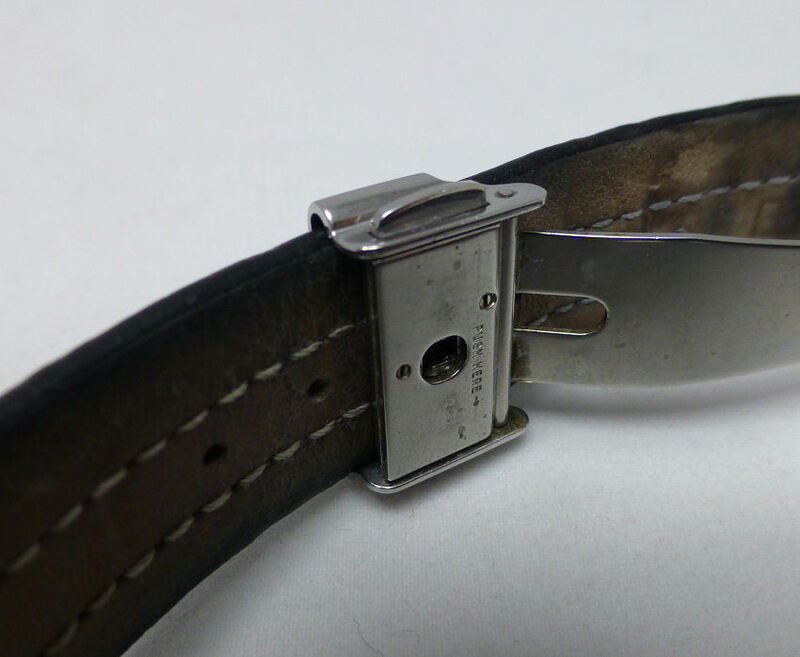 I would note the Longines Deployment Clasp does have not your typical friction fit clamp adjustment. It is more subtle than that. To alter the fit length simply means you have to push in one of the pushers (it’s marked with a little arrow) which allows the small push-button assembly to lift out. Once out, simply re-position the deployment over the strap hole you want, then pop it back in – job done. Now whilst I am a great believer in deployment clasps and this Longines one is rather a good one, on this model it just seems unnecessary. Basically as this is such a neat, super thin and almost delicate watch. So I’m of a mind to go back to basics and fit a standard Longines buckle instead. Fortunately I have an original stainless one of the correct size (18 mm) sitting in my spares drawer which will be ideal. Note – now fitted with photograph at Post end. Uncleaned as yet, but showing no scratches or marks – perfect! So an excellent Auction buy, and whilst it may be for a Quartz everyday watch, it is a high quality one and great value. Longines watches are still and always have been undervalued in my opinion, which fortunately makes them a good choice when looking for a pre-owned watch. And I mean this for both quartz and mechanical models. Part of the reason is that they are not sold at inflated prices and even new they represent good value as the quality is really good and the closer you get to one, the better they look. Looks good on the wrist at just under 34 mm diameter. This particular model is from the early 1990s and as good today as when it was made and I have to say there is a certain “comfortable quality” about it. What I mean is it’s just that everything about the watch feels right. The smoothness of the case finish, the rounded non sharp edges, the elegantly designed dial, subtle luminous markers and hands. In fact the case has a softness about it that appeals to me or perhaps it’s just that the watch has worn well, in every sense of the word. As for today’s fashion I suppose the model can be considered unisex owing to it’s small size, so certainly a good choice if out present hunting and on a budget. Of course that’s always assuming the receiver of the gift doesn’t mind pre-owned. OK not like it was an old dirty pre-owned Patek Philippe, but it’s the thought that counts – right? 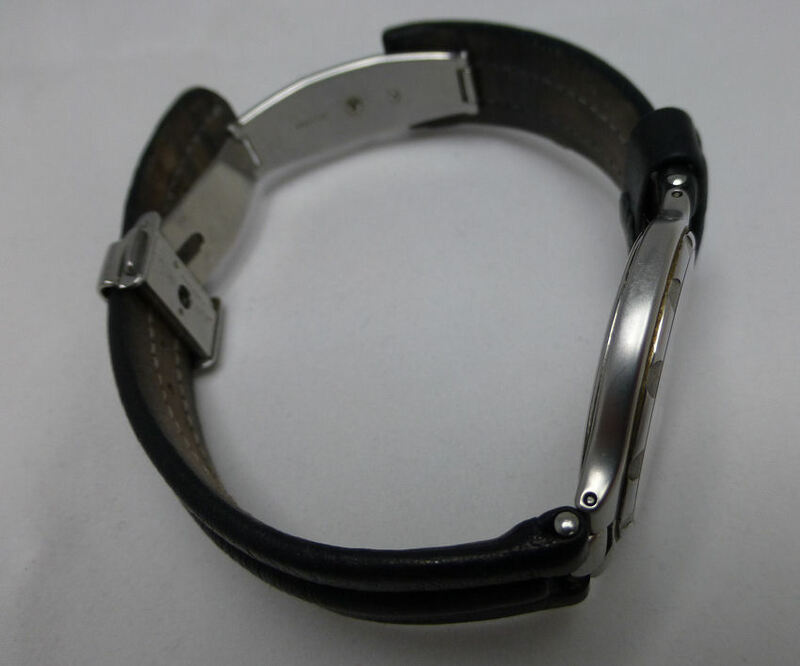 Longines stainless buckle alternative to deployment.